If I could choose one picture to sum it up, this is it. A blur of buying & selling, eyes darting around and of course, people lost in it all - enjoying every moment in this hall. Viewing pictures from CTFKL 1 & 2, I sort of expected a sizeable crowd in the halls of Keramat Mall on that day. Except that my expectations were off. Way off. 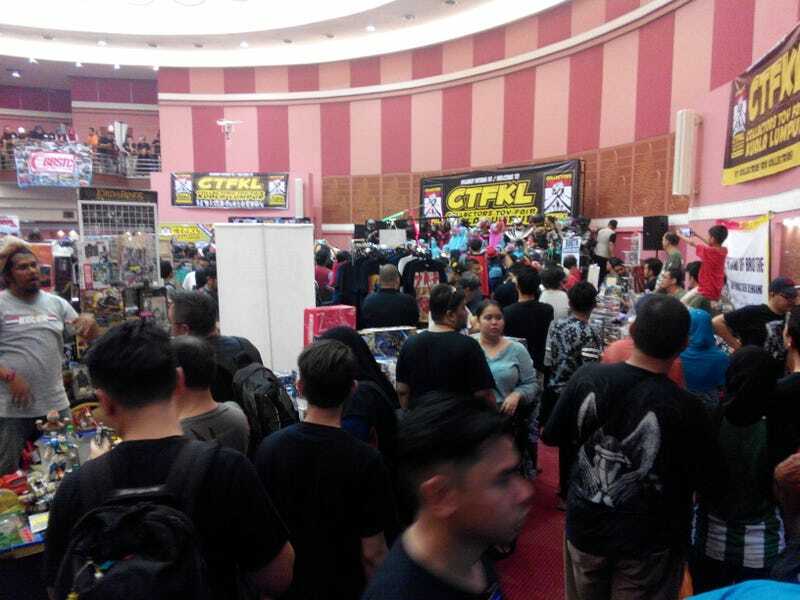 Humbly making its appearance in 2012, CTFKL was born simply to serve the need for a dedicated toy fair for Malaysian collectors. Since then, thousands of Malaysians throng this annual affair and the event owes its exponential growth thanks to the spirit and perseverance of its founder, Wan Kedah (seated second from left). Another reason that this is the fair for Malaysian collectors is that it’s completely non-profit. Entrance fee starts at RM 1, but visitors are open to donate as much as they’d like - with the proceeds going to a few charity homes. Did I mention that everything is done independently, without any sponsors? As you may have noticed from these pictures, the event housed an eclectic mix of toys that would’ve tickled everyone’s fancy - you’d expect that from an event that had 43 participating clubs and over 220 sellers. From diecast vehicles and all the way to figurines, CTFKL had it all. Photodump below! I heard some of you liked Star Wars. These are all signed memorabilia! In the midst of all that’s happening around, the highlights of the day were most definitely the CTFKL Toy Toss(es). A staple of the event since its inception, participants of the Toy Toss stand to gain cool toys for free! It doesn’t matter if the toy is expensive or cheap, everything gets thrown off the stage. Toy Toss pandemonium! I was somewhere in the sea of hands but never got lucky! It’s Live and Let Diecast, so here is the diecast photodump! Okay well maybe this is cheating. I wish my budget allowed me to bring this home! As always, thank you for reading and Viva la LaLD!